NextOn my stereo this week: ‘Warhol” by Lisa Mitchell. Peaceful demonstration and the freedom of assembly are arguably one of the central principles established in most democratic countries around the world. This was no more evident than in the inaugural Women’s March on Washington, on January 21st 2017, in which an estimate of half a million people, featuring prominent politicians and celebrities, marched along the National Mall. Protestors awash in a sea of colours, flags and makeshift posters gathered the day after Donald Trump was sworn in as President because of deep-set concerns that woman’s rights will be eroded under his new administration. The public outcry of support was also strongly felt across the United States, and key cities in 60 countries around the world, where action was called for legislation and policies regarding women’s and basic human rights, to be addressed respectfully, especially after Trump’s aggressive comments throughout the 2016 presidential campaign, divided public opinion across the United States. Some of the central key concerns related to Trump’s degrading comments to woman, Mexicans, Muslims and his plan to repel President Obama’s 2010 Affordable Care Act. As I write here, a few days ago over the weekend, the third annual Women’s March brought out thousands again across the United States to protest against the Trump administration. Interestingly, though, this year’s official march across the US was unfortunately marred by accusations of anti-semitism. But despite the awareness of the controversy, which stems back as far as early 2018, it seemed most demonstrators stood united and still marched. It had also been reported that many other Women’s March groups disavowed their association with the national group and organised their own march. Across dozens of cities around the world as part of the global Women’s March this year, demonstrators apparently also managed to distance themselves from events in America, focusing solely on their concerns about the impact of policies of austerity and violence against women. Photo credits: The header image shows demonstrators at the 2017 Women’s March on Washington. It is used here under the Creative Commons Attribution-ShareAlike 2.0 license. 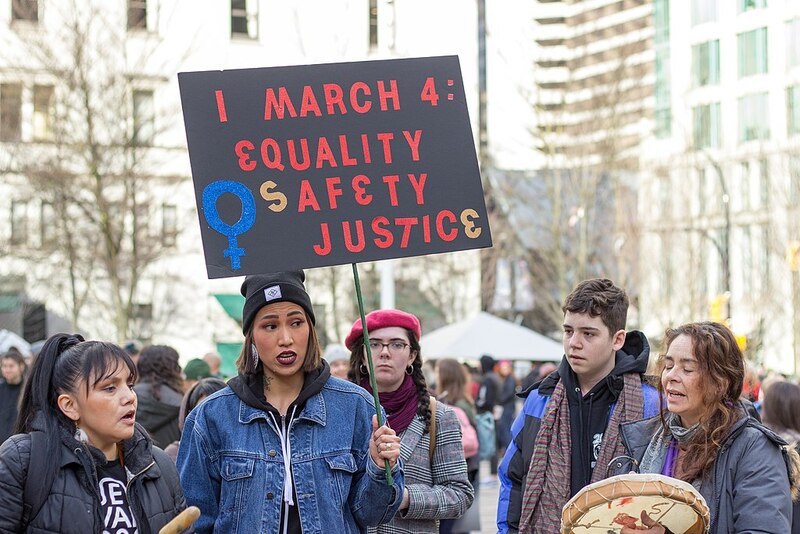 The second image used shows a protestor holding a rally sign at the 2019 Women’s March in Vancouver. It is used under the Creative Commons Attribution-ShareAlike 4.0 International license.